Ah, Murdertusk. While it is one of our humbler film efforts, its site still makes us smile. I’d always wanted to make a web site for a film, and this was a fun chance to do it. The layout’s inclusion of actors’ faces flanking the video at center stage was inspired by old-school film posters, while other pages utilized the gritty, textured appearance of more famous movie web sites. Although it’s goofy, the site’s look is a good example of yet another design style. 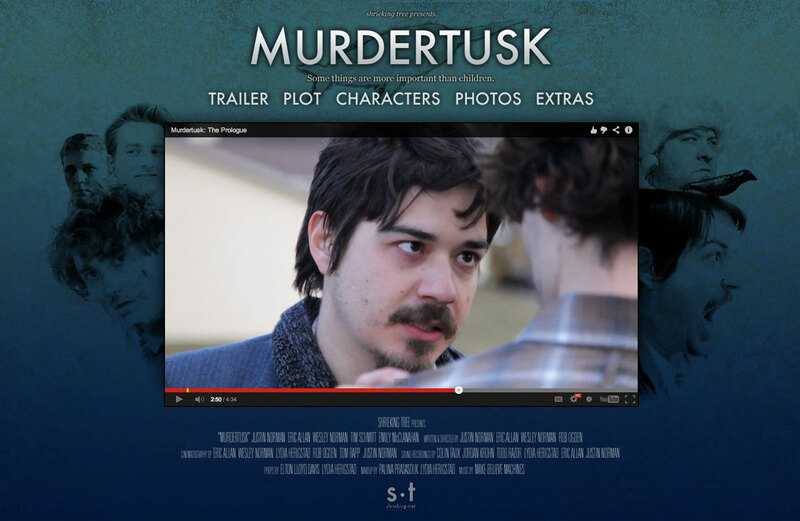 Murdertusk is the first 30-minute film from Shrieking Tree. After losing all of his money producing the failed film, Dragonfist, Thomas J. Buxtehude hatches a plot to capture a narwhal, pluck its prized tusk, and sell it to accrue vast sums of cash just prior to destroying the entire world. Walter, having burnt down Buxtehude’s office, must do his bidding or face blackmail.